DNA sequencing is becoming increasingly important in all disciplines of molecular biology, as well as in applied fields such as diagnostics or forensic research. The speed at which one obtains the results is therefore a critical factor in the efficiency of genomic research and diagnostic work. In 2010, inqaba biotec™ upgraded the sequencing laboratory by the acquisition of an ABI 3500XL genetic analyser. The acquisition has decreased our turnaround time and improved the quality of our reads. The market response was so overwhelming that we acquired a second ABI 3500XL genetic analyser soon after. At present, we produce more than 10 000 reads per month. Exceptional, efficient and energetic technicians perform a variety of molecular techniques such as PCR and Sanger Sequencing reactions at the highest level of precision and accuracy. inqaba biotec™ offers tailor-made sequencing services: single reaction to whole genome; SNP discovery to validation projects. We offer a wide range of services including SIMPLE LANE reactions (giving you maximum control) to our FULL SERVICE. We endeavour to keep our service as flexible as possible to accommodate your sequencing requirements. Simple Lane – A sequence reaction is submitted. All sequencing reactions should be submitted protected from light. Basic Service – A purified PCR product/high quality plasmid DNA and primers are provided to inqaba biotec™ at the correct concentrations. inqaba biotec™ performs sequencing reaction, purification and injection on the ABI 3500XL Genetic Analyzer. Full Service – Unpurified PCR product/plasmid is submitted to inqaba biotec™ . 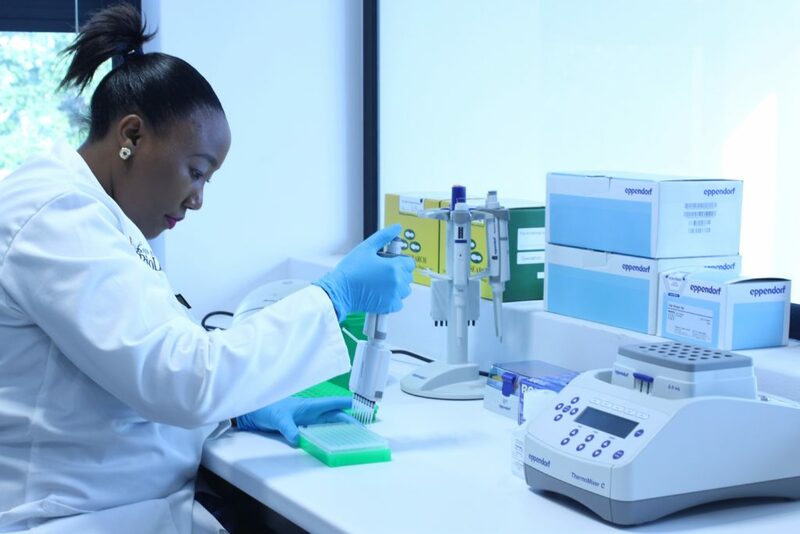 inqaba biotec™ performs purification and quantification of the template, sequencing reaction, purification and injection on the ABI 3500XL Genetic Analyzer. Standard Sequencing parameters: ABI 3500XL Genetic Analyzer, POP7™, BrilliantDye™ Terminator v3.1. Primers – minimum 10μl with a concentration of 10μM + 1μl for every reaction required. gDNA – minimum of 15μl with a minimum concentration of 30ng/μl + 1μl for every reaction required. Click here for more sequencing details. Want to send us samples, complete our Sequencing_Form_2018. Require collection of your samples? Click here.